Talking is something we can all do isn’t it? Just walk past a school playground at breaktime and you can hear lots of chatting as well as shouting! But for some children it’s not that easy, so what can parents and family members do to help? Babies are keen to learn language, right from the start: in fact, babies can do some amazing things that will help them to learn to communicate with words later on. At birth, babies can spot human faces and they prefer them, they want someone to interact with and to talk to them. At six months of age, a baby can tell the difference between the language he or she hears most and an unfamiliar one. By the time they are ten months old, they can hear the differences between sounds in the language they hear most. At this age they’re no longer so interested in an unfamiliar language because they’ve already decided which language or languages to focus on. When a child babbles, he or she is practising moving his or her lips and tongue and also trying to say what he or she hears. Babies learn from hearing language around them. Copy the sounds they make and repeat back whatever you hear from them; this is the start of a conversation! The high pitched, exaggerated voice we use with babies really helps them to tune in to words and you will find they respond more to people who talk to them like this. Talk to them in short sentences too, so that they are able to make sense of what you’re saying, but, use real words and not ‘baby talk’. What are the major speech milestones as a child grows? Just as we have milestones for many aspects of children’s development, we have milestones for language and communication and there are ‘typical’ ages by which we expect children to have developed certain skills. Of course, children all learn to talk at different rates and some children develop more quickly than others. 1 year old: Children start to say their first words at about 1 year old. 18 months old: Children should be able to follow simple instructions by the time they are 18 months old, things like ‘kiss mummy’ or ‘give it to daddy’. 2 years old: They start to put 2-3 words together in simple sentences around the age of 2 years, so they can say things like ‘daddy work’ ‘more juice’. 2 Years old: At age 2 years old they should be able to say about 50 words but understand many more, at least 200. 3 Years old: At about 3 years old children are able to understand longer instructions such as ‘put the teddy in the box’ or ‘get your coat, hat and shoes’. They should now be linking words into sentences about 4-5 words long. 3 ½ years old: By 3 and half years old children should be able to be understood by unfamiliar people. 5 years old: Children should be using well-formed sentences by the time they are 5 years old. What can you do right from the start? Look at your child when you are talking to them. Show them that you’re switched on and ready to listen. It also encourages them to look at you. This is easier to do if your eyes are on the same level as theirs, so get down to their eye level or bring them up to yours. Talk to younger children in short sentences. This helps children understand what you are saying. It also gives them a chance to copy the kind of sentence you’re using. Name the objects your child sees – this could be their toys or things like clothes, parts of their body or household objects. The more a child hears a word, the quicker they will remember it. Children need time to process language, so give them a chance to respond. Resist the temptation to jump in too quickly. Children learn to modify the sounds they use by listening to adults. But they can’t necessarily change the way they say things straight away. If a child attempts a word, say it back to them. (for example if they say ‘Dod’, you say ‘yes, Dog’). But don’t make them say it back to you afterwards. They’ll do this when they’re ready. Children’s speech takes several years to mature. 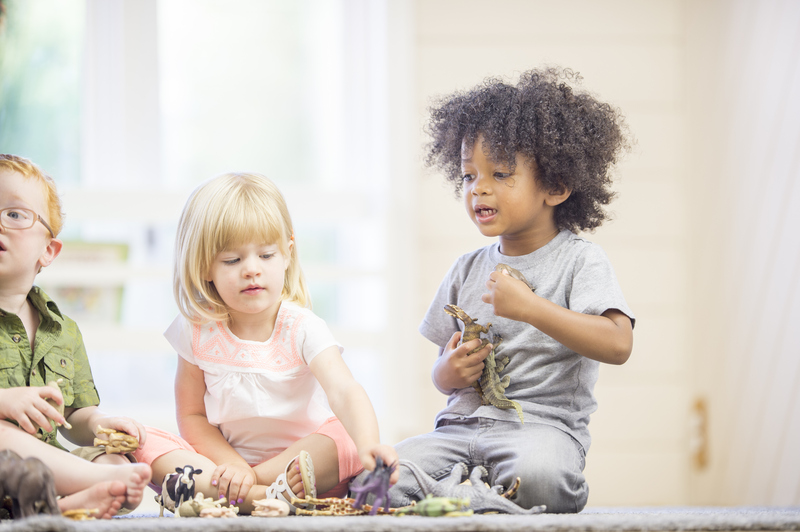 A child learns through playing, so encourage children to play with sounds, by making animal noises and so on. Nearer school age, playing can involve rhyming games or making up words. There are some children that struggle with learning to talk and understand and they will need extra help. Keeping an eye on your child’s language development is really important, so it can be a good idea to make use of tools like the Progress Checker on the Talking Point website to get an idea of how your child is developing. Are they interested in and responding to noises by 9 months old? Do they point to objects to show something they are interested in by one year old? Have you seen them trying to gain attention from others through making noises, using eye contact, facial expression by one year? Are they saying their first words by eighteen months? Do they say twenty-five identifiable words by the age of two? Are they joining words together by the age of two and a half? Can most of what the child says be understood by the attentive listener by the age of three? Can they be understood by people outside of the family by the age of three and a half? Is the child concerned about the way that they sound or showing signs of frustration that they cannot be understood? Using this very simple checklist you can spot children who may not be reaching expected milestones. Look out also for children who find it difficult to focus on an activity an adult has chosen rather than one they choose themselves, who show signs of challenging behaviour and who are disruptive. Ask yourself – could their problems be related to difficulties understanding or using language? When children struggle, getting help as early as possible is important. If you are concerned about your child’s communication skills, an assessment by a speech and language therapist will be really useful. They will be able to assess your child, and give you some ways to support them if needed. If you’d like some free advice and information I CAN, the children’s communication charity, have an Enquiry Service that allows you to speak with a friendly speech and language therapist at a time that suits you. Call 0207 843 2544 for more information or to book a call. ← Liverpool linked with move for Albanian keeper!